Welcome to the OVERDOSE RACING web pages. 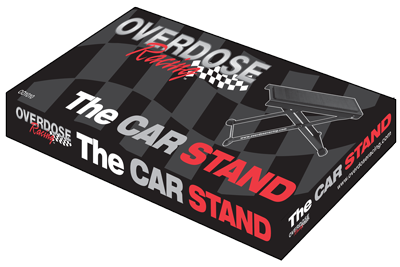 OVERDOSE RACING is available to all visitors from the USA, and provides online purchasing of OVERDOSE RACING products. All use of the OVERDOSE RACING web pages are subject to the terms and conditions listed below. By browsing the OVERDOSE RACING web pages, you hereby express your agreement and acceptance of listed terms and conditions. If you do not agree with these terms and conditions, please be conscious of the fact that you do not have the right to use these web pages. Disclaimers and Limitation of Liability THIS SITE IS PROVIDED BY OVERDOSE RACING ON AN "AS IS "AND "AS AVAILABLE" BASIS. OVERDOSE RACING DISCLAIMS ALL WARRANTIES, EXPRESSED OR IMPLIED, INCLUDING, BUT NOT LIMITED TO, IMPLIED WARRANTIES OF MERCHANTABILITY AND FITNESS FOR A PARTICULAR PURPOSE. OVERDOSE RACING WILL NOT BE LIABLE FOR ANY DAMAGES OF ANY KIND ARISING FROM THE USE OF THIS SITE, INCLUDING, BUT NOT LIMITED TO, DIRECT, INCIDENTAL, INDIRECT, PUNITIVE AND CONSEQUENTIAL DAMAGES. SOME JURISDICTIONS DO NOT ALLOW EXPULSION OF CERTAIN GUARANTEES OR LIMITATIONS. IT MEANS THAT THE RESPONSIBILITY OF OVERDOSE RACING WILL BE LIMITED IN THE MAXIMUM POSSIBLE EXTENT PERMITTED BY LAW. OVERDOSE RACING will not be liable for any damage caused by omissions, interruptions, deletion of files or email, errors, defects, viruses, delays in operation or transmission, communications failure, theft, destruction, or unauthorized access to OVERDOSE RACING records, programs, or services. The User agrees to use the OVERDOSE RACING web pages only for lawful purposes. The User is prohibited from posting on or transmitting through OVERDOSE RACING web pages any unlawful, harmful, abusive, harassing, vulgar, obscene, sexually explicit, hateful, racially, ethnically, or otherwise objectionable material of any kind, including but not limited to any material that encourages conduct that would constitute a criminal offense, give rise to civil liability, or otherwise violate any applicable local, state, national, or international law. OVERDOSE RACING reserves the right at all times to disclose any information that OVERDOSE RACING considers necessary to respect or follow legal process, to post or to remove any information or materials, in whole or in part, in OVERDOSE RACING's sole discretion or when it is considered harmful to the interests of another User, a third-party Provider, or a service provider. OVERDOSE RACING will contact you only in two cases. The first case is when you subscribe to receive emails. In that case, you will receive our emails about new products, etc. The second case is when some problems occur with your order. We will then contact you by telephone or through e-mail in order to resolve the current problem and deliver your ordered product(s) in a timely manner. You will never be contacted by e-mail with intention to verify your login, password, or other personal identifiable information. OVERDOSE RACING understands that you need to maintain your privacy when you use the Internet. OVERDOSE RACING respects your interest to keep your personal information secure. Therefore, OVERDOSE RACING is committed to protecting your privacy with modern and effective technologies. OVERDOSE RACING appreciates your trust and will handle your personal information very carefully and discretely. This shopping cart is accessible by all visitors. However, at this time, shopping through the shopping cart is available only to the USA. For complete information see Buyers Service. You are responsible for paying the entire amount due on your purchase, including any applicable taxes, shipping and other charges assessed by the merchant. You represent and warrant that you are at least 18 years of age and that you possess the legal right to use OVERDOSE RACING in accordance with the stated terms and usage policies.